Beyond the erasure of Peter Parker’s marriage to Mary Jane, the controversial “One More Day” storyline also created a Marvel Universe-wide “mind wipe” of anyone who knew that Peter was Spider-Man, effectively giving Spidey his secret identity back. 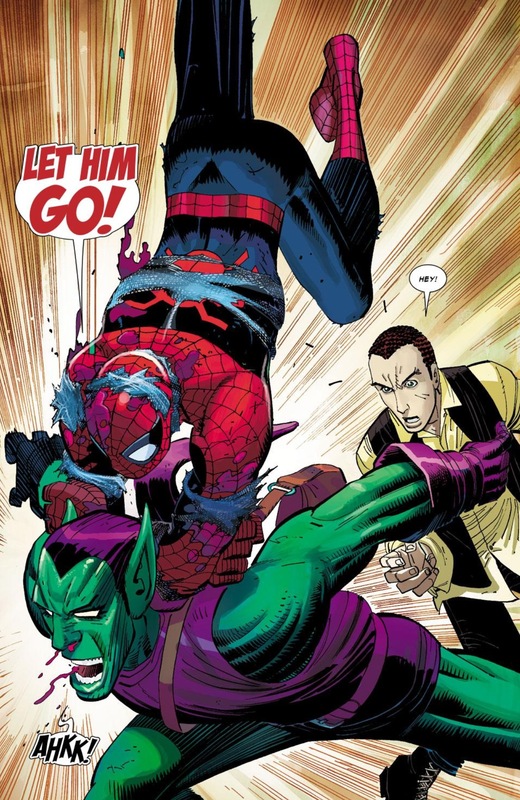 At that point in history, Spider-Man had recently taken off his mask during the “Civil War” storyline, but there was also a whole host of heroes, villains, friends and family members who had known about Spidey’s secret identity for years prior to Civil War – most notably Norman Osborn, aka, the Green Goblin. 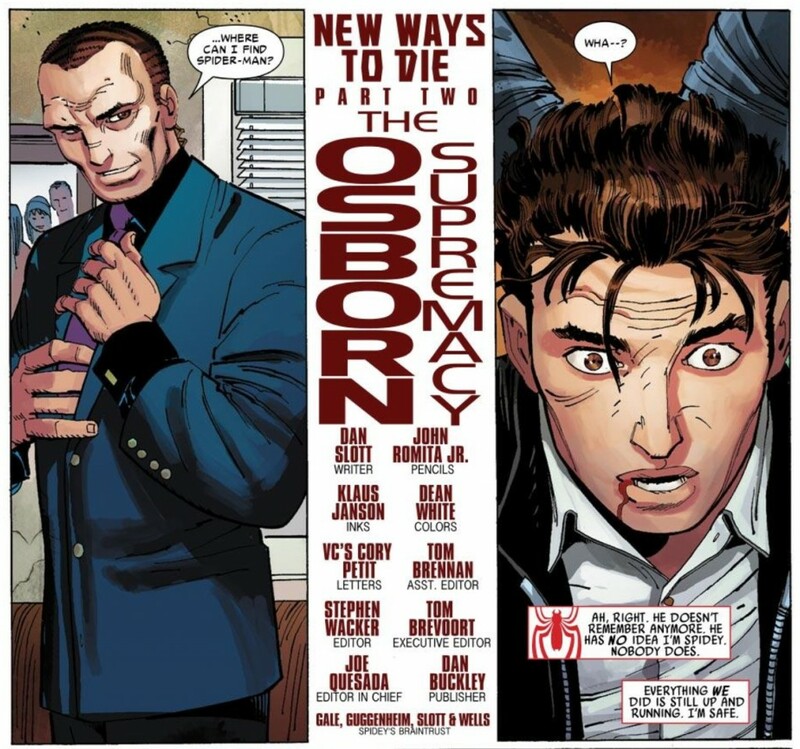 What made me select “New Ways to Die” as the 10th entry on my “Top 10 Goblin Stories” list is the fact that it marks the first time Spider-Man and Osborn squared off after this dramatic status quo shift – arguably the most dramatic retcon of its kind in Spider-Man history. Additionally, it marks the first showdown between Spidey and Osborn after Norman became the head of the Thunderbolts – a supergroup consisting of sociopaths like Bullseye and Mac Gargan’s Venom, that was sanctioned by the federal government to capture and detain all unregistered super-powered individuals (per the outcome of Civil War). The circumstances behind the encounter create two very unique twists, making this Spider-Man vs. Green Goblin confrontation vastly different than any other in Spider-verse history. Prior to “New Ways to Die,” because Peter and Norman knew each other’s big secret, there was a deeply personal connection between the two characters that naturally led to an immeasurable amount of tension whenever they interacted in a story. In “New Ways to Die,” Peter still knows Norman is the Green Goblin, but Norman doesn’t know about Peter and Spider-Man. And while that might sound like very un-dramatic stuff on paper, what makes “New Ways to Die” so much fun is the way Dan Slott continues to tease the old status quo, almost begging readers to have a collective heart attack as Norman inches ever so closer to finding out who Spider-Man is before getting thrown off the scent. Like the series finale of The Sopranos, the comic just “cuts to black,” with a superb cliffhanger. Of course, ASM was publishing three times a month at this point, so it’s not like people had to wait THAT long, but the point stands – why is Norman Osborn in Peter Parker’s apartment? What is he looking for? Does he know Peter is Spider-Man? Did the Mephisto mind wipe not affect him? We learn very quickly in ASM #569 that Osborn does not remember Peter was Spider-Man, and he had just come to his apartment because he knows Peter takes pictures of Spider-Man (though, no longer for the Daily Bugle, which had been converted into a sleazy tabloid while the Bugle’s top reporters like Joe “Robbie” Robertson and Ben Urich launched their own publication Front Line). That doesn’t take away from the “Han frozen in carbonite” feel to ASM #568’s ending, and the pulse-racing qualities to Norman’s first conversation with Peter an issue later. Yes, Osborn doesn’t know Peter is Spider-Man, but Peter knows Norman is the Green Goblin – his arch nemesis; the man who killed his first true love, Gwen Stacy, and the man who has mentally and physically tortured him many times over (in stories that are sure to come up in my countdown). Additionally, as the head of the Thunderbolts, Norman is a sanctioned hero who has been given carte blanche to do whatever he wants to “unregistered” super-powered individuals in the name of a twisted sense of “justice.” The fact that Norman has arbitrarily decided to insert himself back into Spider-Man’s life is still a “here we go again,” moment for Peter, even if his secret identity is momentarily safe. This initial encounter plays into why the Green Goblin is such an exceptional foil for Spider-Man: Norman’s wealth, power and ability to manipulate people essentially render Spidey and Peter powerless. As the adage goes, “you can’t fight city hall,” and in the same vein, there’s very little Peter has ever been able to do to combat Norman Osborn. Upon his return from the “dead” in the 1990s, Norman successfully distanced himself from the Green Goblin and turned public opinion against Spider-Man and others (like Ben Urich) that persecuted him – all while laughing in Peter’s face. In “New Ways to Die,” the fact that Peter is really Spider-Man and Norman doesn’t know anymore is irrelevant: Norman is still going to do whatever he wants, to whoever he wants, and there’s nothing Peter can do to stop him. Further into the arc, Slott gives us another heart attack. In ASM #571, Norman finds Peter’s camera and notices how in every photo of Spider-Man, his spider-insignia is dead-center. This leads Norman to conclude … that Peter is a “front man” for Spider-Man and that there’s a chip in Spidey’s costume that communicates to the camera. By hacking into that frequency, the Thunderbolts are able to use their weapons against Spider-Man with deadly accuracy. This scene leaves me feeling a couple of different things. On one hand, I love how Slott teases us some more about Norman maybe guessing Peter’s identity. The answer is staring Norman straight in the face, but rather than go the obvious route, he thinks so lowly of Peter he disregards him as some kind of “front man” Spider-Man uses to make a couple of bucks. Then again, this is a story-telling technique Slott has used with frequency throughout his Spider-Man tenure, most notoriously on Superior Spider-Man: serving story over character. Norman has always been portrayed as a dangerously smart individual and a master manipulator. What, outside of an editorial mandate from Marvel’s front office, is preventing him from putting two and two together when he discovers Peter’s camera at the scene? And when did Spider-Man’s costume have a tracer that attracted his camera? It’s not that it’s outside the realm of possibility – Peter certainly has created some pretty nifty inventions in the past (his web shooters come to mind). But I just don’t remember this, so I’m sincerely asking if this is a deep-cut part of continuity that I’m looking past? ASM #569 marks the debut in the latest iteration of Eddie Brock’s character, Anti-Venom. In this arc, we learn that a cancer-ridden Eddie visits the F.E.A.S.T. shelter run by philanthropist Martin Li (who is secretly the supervillain Mister Negative). 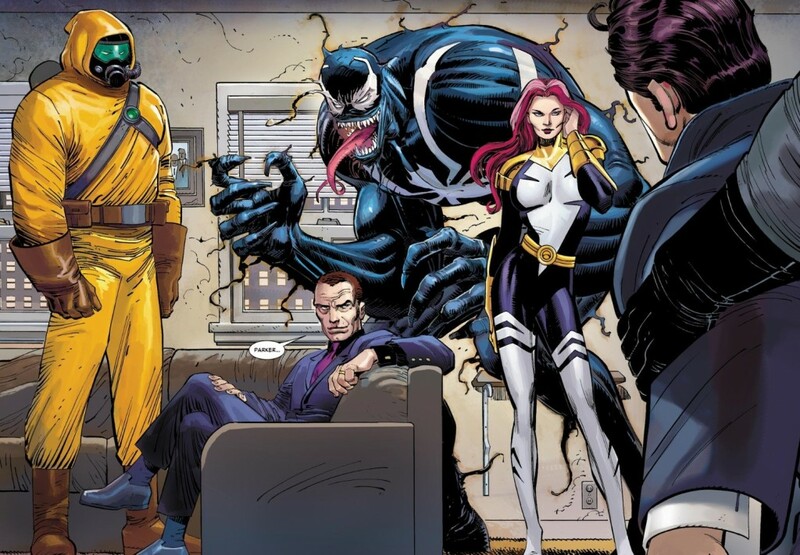 Eddie’s cancer is magically cured by Li’s touch, which also happens to “purify” the remaining traces of the symbiote in Brock’s bloodstream, creating Anti-Venom. 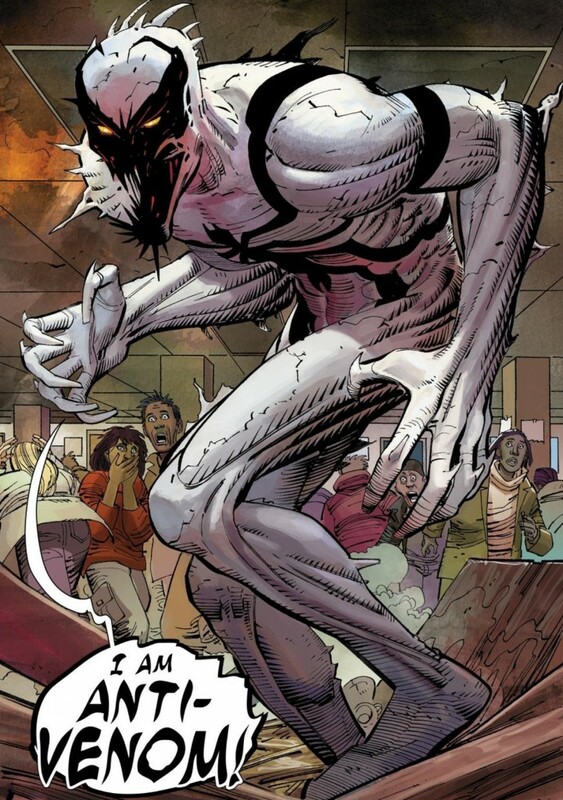 After almost “curing” Spider-Man’s radioactive blood (and robbing him of his powers), Anti-Venom joins Spidey in his fight against the Thunderbolts, primarily because he wants to take out Gargan-Venom. 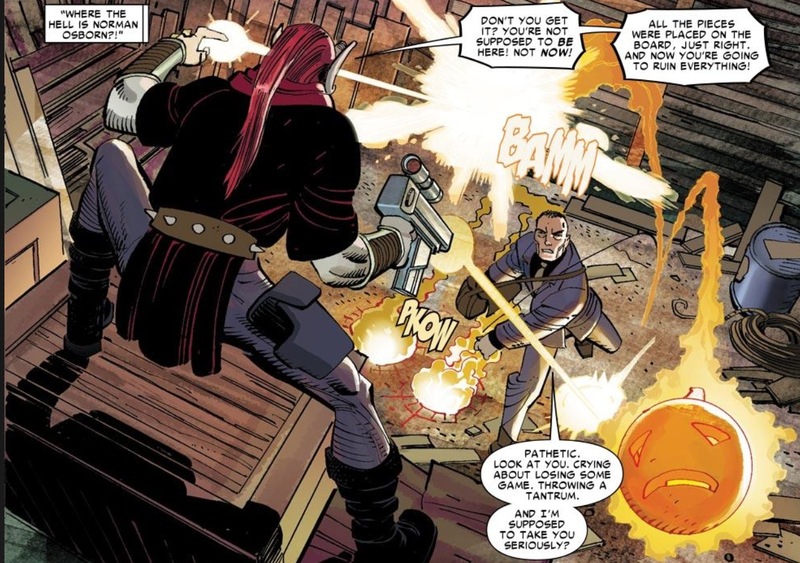 These stories also mark the first interaction between Norman and Marvel’s newest goblin, Menace. These are such funny stories to read in hindsight because 1) everyone keeps referring to Menace as “he,” and 2) there’s a couple of scenes where Norman sees that someone has broken into his Goblin-supply closet and he assumes it’s Harry. Of course Menace would later be revealed as Lily Hollister, Harry’s girlfriend, and daughter of the political candidate that Norman is actively working against. Then there’s Norman’s interactions with Harry that help make “New Ways to Die” a worthwhile story. For the uninitiated, Harry came back from the dead (mysteriously) in “Brand New Day” as part of the big status quo upheaval, and he was mostly portrayed as wanting a normal life, running the Coffee Bean café. But his father’s presence always has a habit of sending Harry over the edge (which plays into the Menace mystery as well). Plus, any character-dynamic that gives us an image of a smirking unmasked Norman wearing his goblin attire while holding a “world’s greatest dad” mug is alright by me. The actual Spider-Man/Green Goblin confrontation isn’t a true knockdown drag-out fight, but it does echo the duo’s earlier brawl in the classic ASM #39-40. One of Norman’s Oscorp Buildings is burning down around them, and Spider-Man is faced with the choice of either bringing Norman to justice or rescue a group of immigrants undergoing a series of bizarre medical tests (which Norman blames on Harry) who are also trapped in the building. Besides, in typical sleazy Norman fashion, he taunts Spider-Man by telling him even if he was turned over to police, he’s still a “hero” in many eyes and would likely be exonerated. All of these elements are enough to move “New Ways to Die” to the outer edge of my countdown. And outside of that one bit with the camera-tracer, Slott absolutely nails Norman’s oh so smug quality that has made him such an iconic member of Spidey’s rogue’s gallery. 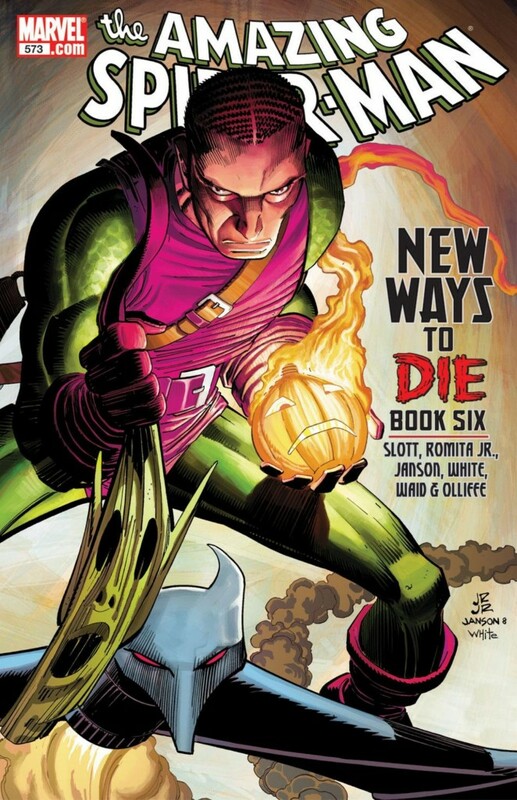 More important, “New Ways to Die” brings the Osborn legacy back to the ASM universe in a major way, with a twist, and for that alone, I think it warrants a place among the greatest Green Goblin stories of all time. Next week, I’ll unveil my No. 9 entry in my “Top 10 Green Goblin Storylines” list. The tracer in the spider suit thing actually was set up in an earlier comic. Specifically in ASM #552. 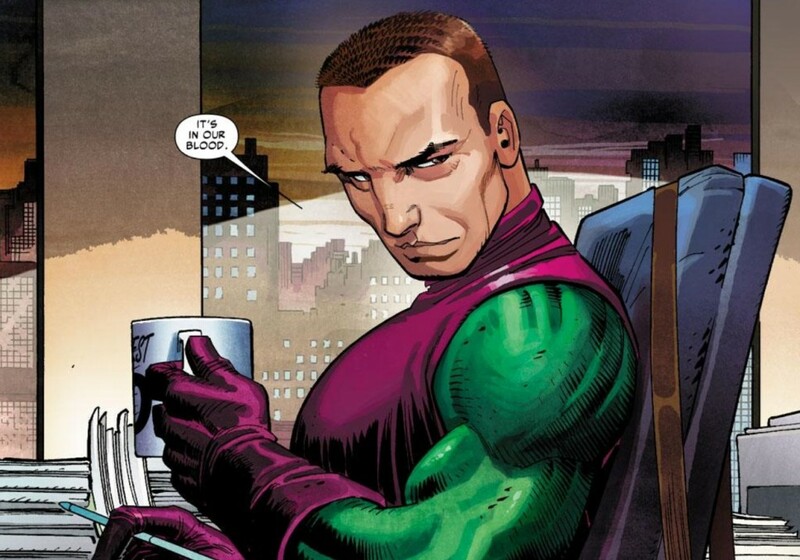 And there actually is a reason why Osborn doesn’t make a connection that Peter Parker is Spider-Man. When the mind wipe occured, it not only erased Peter’s identity from everyones’ minds, it also put a mental blindspot so they cannot make the connection that Peter Parker is Spider-Man. It was explained in ASM #590. 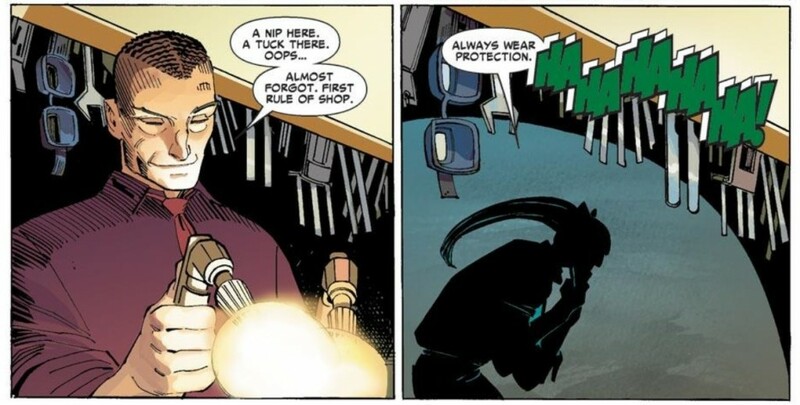 I actually like Norman’s ‘oversight’ of the Spidey-Peter identity when discovering the camera chip (ignoring the IMO lame and cheap reveal in a later issue that no one is ALLOWED to discover that Peter is Spidey) – to me the only thing that overshadows Osborn’s mastermind is his hubris. I don’t think he would *let* himself admit he’d missed something as obvious as Peter Parker being Spider-Man – he’d rather perceive a devious scheme (like one that he would concoct!) 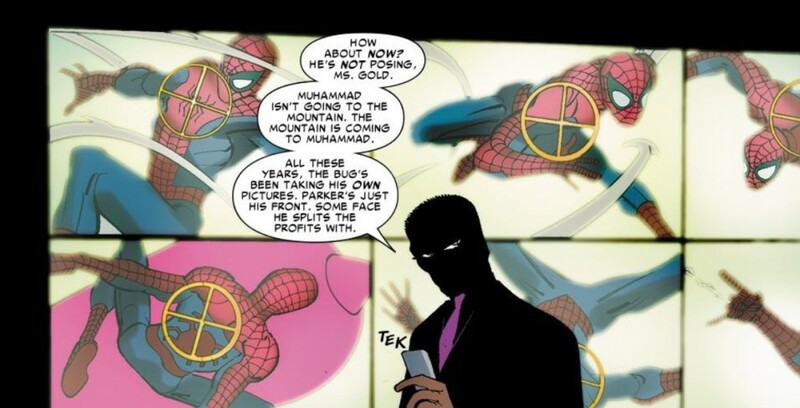 about Spidey using a front-man to outsmart everyone. He’s over-thinking his opponent in order to maintain the illusion of his own genius. Or I’m over-thinking this story to maintain the illusion of my own genius. But as I read it, it seemed in keeping with his established character. I need to go re-read this one though, it’s been a while and I definitely liked it a lot at the time. Great blog by the way! I’d given up on comics around 2010 (I died during Blackest Night) and you got me back reading them, starting with Spider Island. I always thought that Spidey should’ve been way more on edge during Osborn’s time in power. I would’ve liked to see him completely lose his marbles. Maybe it should’ve been peter going after Osborn during “the list” instead of hawkeye. The guy kills your college sweetheart and now he’s the world’s top cop…. With Bullseye and Venom in his stable? Wouldn’t that make you have a mental breakdown?